It was the greatest late-Bronze Age center of civilization in Greece. It was so powerful that the period from 1600-1100 BC us known as the Mycenaean. Its written language, a syllabic script, is the earliest form of written Greek. Sometime during its later history its legendary king Agamemnon, united the various kingdoms of Greece, amassed an armada, and set sail to retrieve Helen of Troy, the wife of his brother, Menelaus, king of Sparta. 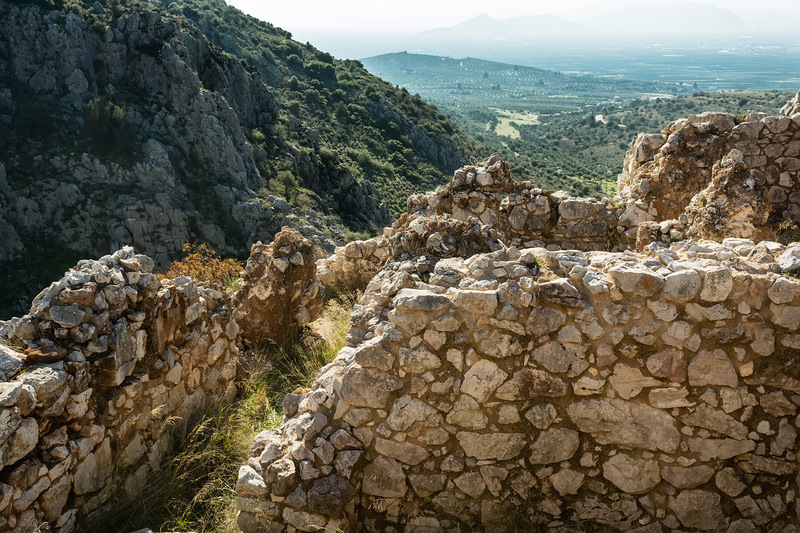 If you stand on the hilltop citadel of the ruins of this city, you can see all the way down the flatness of the plain of Argos (or the Argive Plain) to the Argolic Gulf and Nafplio, 12 miles (20 km) away. The plain was once a bay, until it silted then dried up, forcing the Mycenaens to move their port to Nafplio. Mycenae was sited between two cone-shaped hills on a low plateau which commands the Argive plain, controlling both land and sea routes. After the successful campaign against the Trojans, Agamemnon returned home, only to be murdered by Aegisthus, the lover of Clytemnestra, Agamemnon's wife. Agamemnon's children are important players in ancient Greek history/myth: his daughter, Iphigenia, was sacrificed by her father to ensure permission for his ships to sail to Troy. HIs daughter Electra, along with her brother, Orestes, plotted revenge against their mother for her betrayal of Agamemnon. 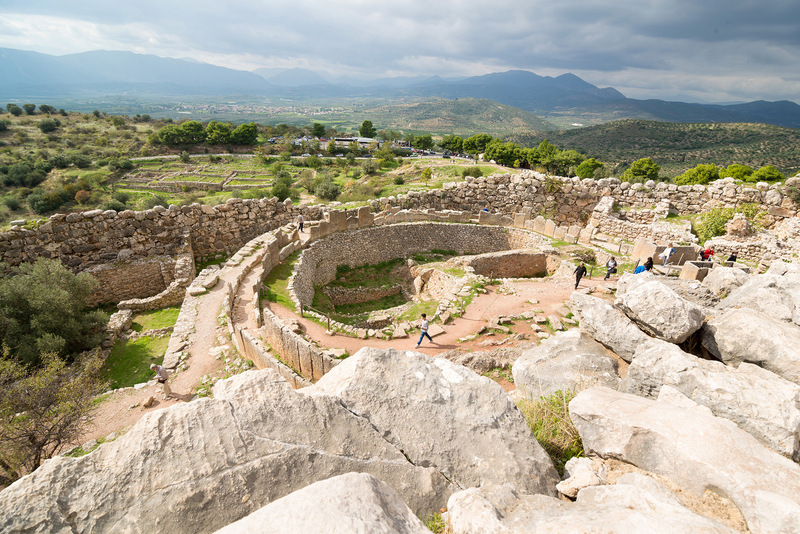 In addition to the Iliad and Odyssey, the tragic life of Agamemnon, and the stories of Iphigenia and Orestes, the story of labors of Hercules come out of Mycenae. The entire existence of Mycenae was doubted for centuries until German-born archeologist and philhellene Heinrich Schliemann uncovered it in 1876. His greatest discovery was the pure gold Mask of Agamemnon, currently on display at the National Archeological Museum in Athens. At the time Schliemann thought he had discovered Agamemnon's grave, but subsequent dating puts the grave at about 1500 BC, some centuries before the Trojan War. The city at its peak numbered around 30,000 inhabitants. Schliemann uncovered the Acropolis, where the king's palace and royal tombs were. The Lion's Gate, at the entrance to the citadel, is the earliest work of monumental sculpture in Europe. 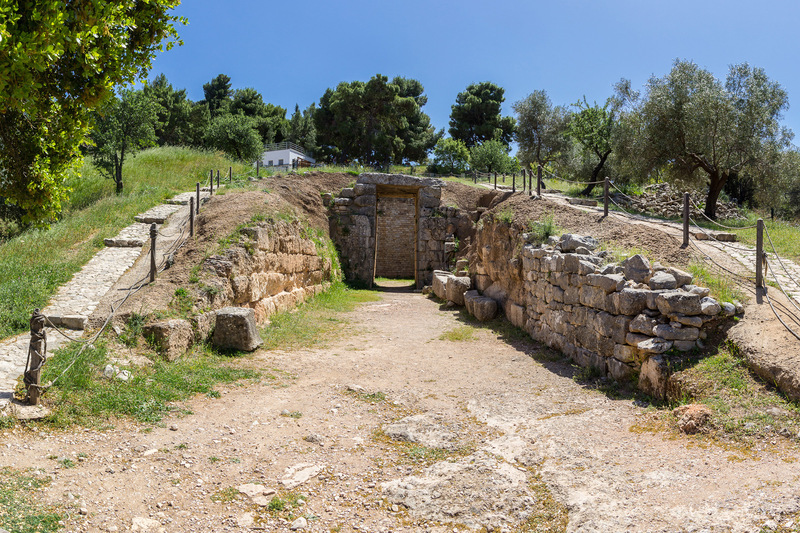 There is a climb through ancient buildings, along narrow streets or paths, leading towards the palace where Agamemnon was murdered by his wife and her lover. Just inside the Lion's Gate to the right is Grave Circle A, containing six royal shaft graves. Its shape contrasts with the angularity of the other structures of the acropolis. Many "kterismata (objects buried with the dead)" were found, as well as a number of gold death masks, all now displayed at the National Archeological Museum. A point of interest that a lot of tourists miss is the Treasury of Atreus. It's outside the citadel, on a hill opposite, just past the parking lot. 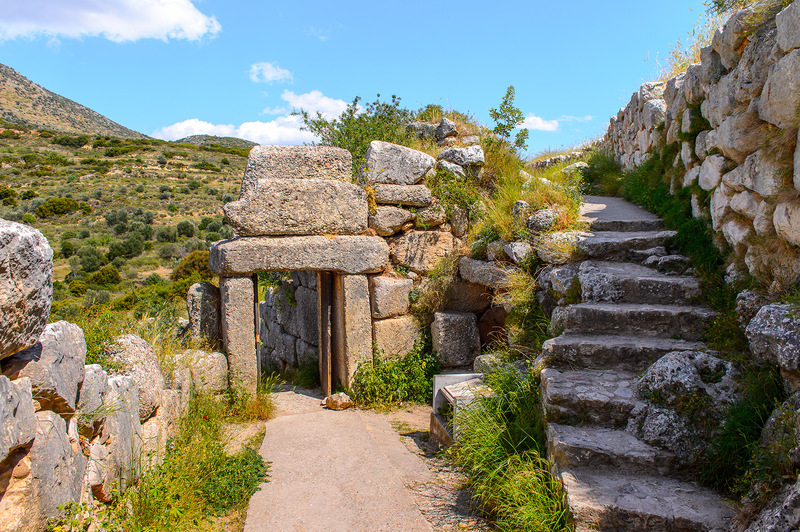 It is a tholos tomb, a large burial cavity with a dome shaped like a beehive and covered in earth. Built about 1250 BC, it has long since been plundered of riches. It is also called the "Tomb of Agamemnon." 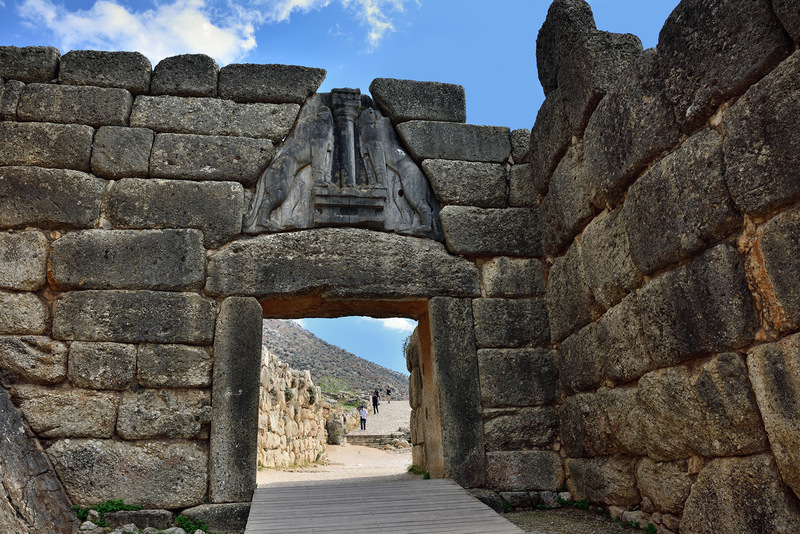 Mycenae is an eerie, silent place, a place of ruined walls and buildings, a place to make one wonder at the passing grandeur of all civilizations. Mycenae is a UNESCO World Heritage site.